In our last post, we have gone through the data page structure and we have noticed that there is an overhead of 7 bytes in each records. Let us try to understand how SQL Server stores the records in a data pages. Data record stores actual data. In other words, it store the records in heap or the records in the leaf level of clustered index. The data records are stored in a structure which helps SQL server manage these record efficiently. Let us see a pictorial representation of a data record. The section which are marked in blue are part of all data records.The other section will be part of the data record depends on fixed length / variable length column are available in the table structure. Bits 1 to 3: This is three bit value define the record type. 4 blob fragment or row overflow data. Bit 5: Indicate variable column exists or not. The second byte used for status bits 2 . Only one bit is used in this to indicate that the record is ghost forwarded record. The next n bytes are used to store the fixed length data available in the table where n is the total size of the fixed length column in the table. This part will not be there in the record structure if all column in the table are variable length column. Next 2 bytes are used to store the total number of column in the table. Next n bytes are used for null bitmap. one bit for each column in the table. value 1 in each bit indicate the corresponding column has NULL value in that record. The value of n will be no.column the table/8 and round to next integer value. 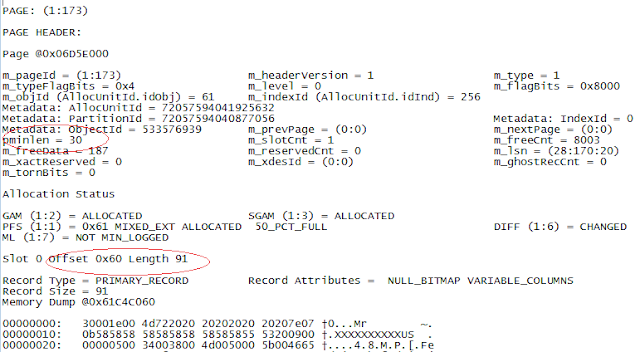 Next 2 bytes are used to store the number of variable length column in the table. Next n bytes are used to store variable column offset array .This is nothing but the starting offset value (with respect to the page) of each variable length column.Each variable column requires 2 bytes. The value of n will be 2 X no. of variable length column in the table. Next n bytes are used to store the actual data of variable length column . The value of n will be the total size (actual data stored not in the definition of the table) of variable length column. The pminlen value 707 in the header is the total size of the column (703 bytes) , 2 bytes used for status bytes and 2 bytes used to store the size of fixed length columns. The Length 710 mention in the record slot is the sum of pminlen, size of null bitmap (1 byte) and 2 bytes used to store the number column in the table. Let us try another example with variable length column. Hope you got clear idea about the storage of data in the SQL server page. Your blog is very informative! I am glad I stumbled upon it via a google search for blocking email notifications! Dear John, this blog is very helpful. Could you explain the case of Null data (existing of missing column) for both fixed and variable length cases? If phone char(10) in any row is omitted, I wonder that the length of fixed data is redued or not? Does 10 bytes space('20') be filled? How about similar case for varchar ? I'm sorry for my poor English. I'm not native in English. case 2: for the same table created clustered index and length of record increased by 2 bytes. case 3: for the same table without clustered index and 1 non clustered index has different length of a record on index pages for an integer column. Case 4: With Clustered and 2 Non clustered index I got different length of records for non clustered index columns and pages.